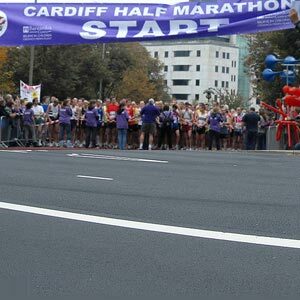 There are two sub categories in the Cardiff Marathon - the half Marathon and the full marathon. The Half Marathon Runners have to cover 13.1 miles while full marathon runners' finish at 26.2 miles. Thousands of water bottles dumped along the streets of Cardiff by marathon athletes have been recycled. If the bottles had been laid end to end, there would have been enough to circle the circumference of the Millennium Stadium 10 times. Workers from Cardiff City Council collect more than 800 kg in plastic water bottles after the completion of the marathon and send them for recycling. The first Cardiff Marathon in 2002, raised ?200,000 for over 100 charities and the second Cardiff Marathon in 2003, raised over ?300,000 for nearly 150 charities while the third Cardiff Marathon in 2004 raised in excess of ?400,000 for over 160 charities. The third Cardiff Marathon and Half Marathon took place on Sunday 3rd October 2004. It supported the cause of Meningitis and the 2005 Marathon funds the Alzheimer's. The Marathon course is a very flat, fast one. It is a half marathon course, with full marathon runners completing two laps. The Cardiff Marathon course has refreshment stops approximately every two miles. An ambulance is present to administer first aid if needed and roving vehicles are ready to pick up any runners who are unable to complete the course. Normally the South Wales Police and Cardiff County Council personnel man all road closures and traffic movement. Shower facilities are also available at the Welsh Institute of Sport, at a cost of ?1 per person.